For quite some weeks I have been getting my ear bashed about about getting some additional help around the farm. There is so much to do and as the building work gets underway, there will, I’m sure be even more to be kept busy with. 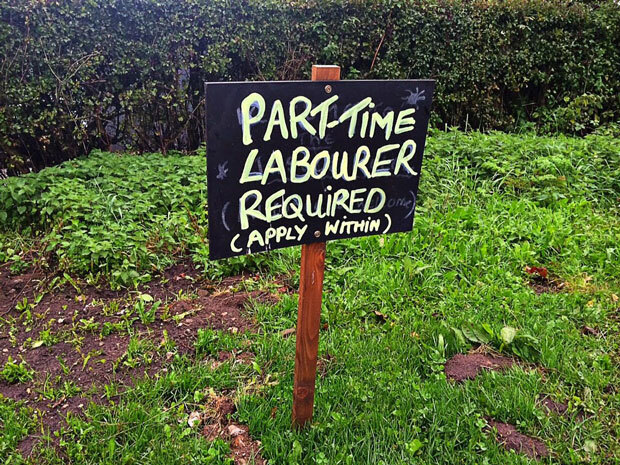 Wendy made a sign to put up, which read ‘Part Time Labourer required – Apply within’. I certainly wasn’t sold on the idea, as I felt that I was organised and would get to all the jobs eventually, but some would just take a little longer than others. Well, after some lengthy discussions, the sign went up outside the front gate and we sat back and awaited some response. Before 48 hours had passed, I got a call from a 16 year old young man, enquiring if the position was still open as he was interested in the job on a short term basis. He explained that it would only be up until he commenced with his Agricultural Engineering apprenticeship. It surprised me a little, as I hadn’t really considered that a young person would apply, but agreed to meet him to discuss the opportunity and to establish his suitability for the role. After meeting with ‘Louis’, we agreed that he would start the next day. He was like a breath of fresh air, keen, hard working and full of initiative and ideas. For example, one of the jobs we were doing included emptying half of the barn ahead of the building work commencing. This meant that as part of the mass reorganisation we had to find a home for a large pile of logs and Wendy had already suggested we cut the top off an old IBC tank and put the logs into it. So, we went ahead, completed that task and I was all set to take the metal frame which was around the tank over to the local tip. That’s when Louis came up with his suggestion, “Rather than throwing the frame away”, he said, “why don’t you use it as a feeder for the sheep, that’s what we did when I worked on another farm”. “Show me”, I said and he promptly did. He tightened the frame up and secured it to a wooden pallet and hey presto, we had a feeder for the young male sheep or wethers as they are really called and it saved me a bucket load of money to boot. Why didn’t I think of that? It’s now in the field awaiting the arrival of winter in the coming months. In reality we got more than 2 weeks work completed in less than a week, as I could just give him his list of jobs each day and he would crack on until they were completed. I was well impressed, he’s obviously spent lots of time around farms and with such a great attitude too! It’s only a guess, but it looks like Alice the duck has become dinner for Mr.Fox. We have witnessed nothing but she just hasn’t shown up for several days now, but we live in hope. So, for now we are down to just 4 ducks on the farm but we shall see what the coming months bring. The most common question I get asked is, “ Are you still ‘Living the Dream’? I sometimes think that people presume that in some way the novelty has worn off or we have found things too hard to contend with. We leapt into our adventure with our eyes wide open and I can confirm that our dream is most certainly very much alive and kicking.